As you may have seen in the news this week, President Obama has been in Northern Ireland at the G8 summit. While he has been distracted with matters of the world, his lovely wife and daughters got to do a little bit of sight-seeing. 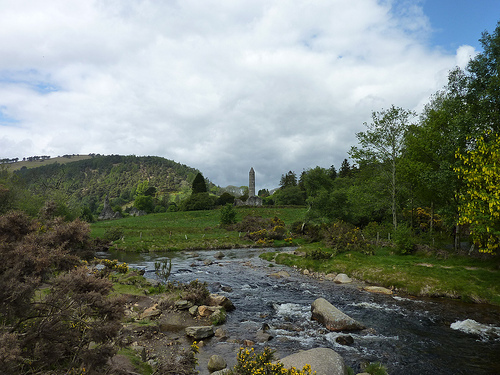 Whoever created their itinerary made a great choice when deciding on a trip to Glendalough. I’m sure Ms. Obama and her daughters must’ve been impressed at what they saw here in the Wicklow Mountains National Park. While at the park, the Obama girls were given a guided tour of the area. 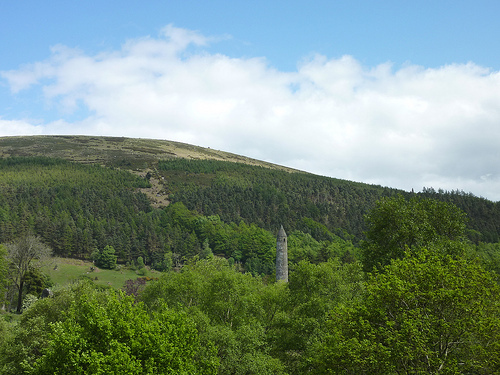 The tour included a trip to the very famous Glendalough Round Tower. This is probably one of the best preserved Round Towers in Ireland. In total approximately 130 of these towers were built in Ireland. You can read more about how they were used, and about their unusual physical characteristics in this previous post. 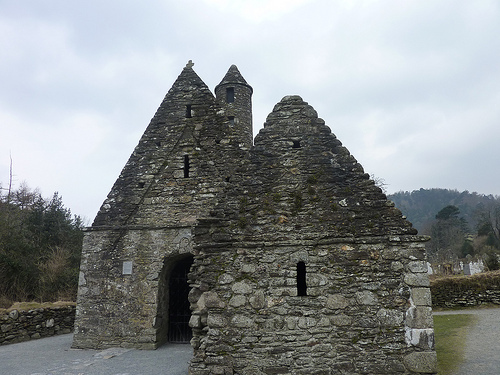 The monastic settlement in this area was first established in the 6th century, by Saint Kevin. Kevin, a descendant of one of the ruling families in the province of Leinster, studied in this area as a young boy, and returned to the area at a later time to found a monastery. Many monuments in the area are named after St. Kevin, including St. Kevin’s Cell and St. Kevin’s Church. 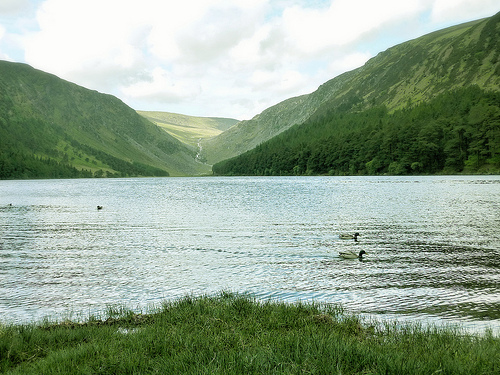 The word Glendalough is an Anglicization of the Irish (Gaelic) Gleann Dá Loch, meaning “glen of two lakes”. If you are lucky enough to visit this area on a bright sunny day (those are rare in Ireland), then the photos you take will make for perfect postcards or e-cards. As you can see, the lakes and rivers, hillsides and ancient structures, show off some of what’s best about Ireland. 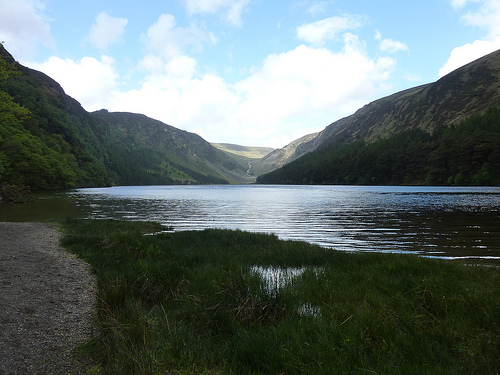 For more information about Glendalough and the Wicklow Mountains National Park, please visit wicklowmountainsnationalpark.ie and for tours and tourist amenities in the Wicklow area you can stop by Ireland Tours. I always regret not visiting here and me being so close in Dublin for a month! Well, gives me another magical place to visit when I return!